Tracking Marauding Pigs Goes High-Tech, Tracing DNA From Mud Puddles : The Salt Wild hogs inflict $1.5 billion in damage on U.S. property each year. But biologists can now track the elusive animals via tiny bits of DNA the swine leave behind in puddles and ponds. This wild hog from Hawaii was raised at the National Wildlife Research Center in Fort Collins, Colo. Feral pigs in the wild tend to eat anything containing a calorie — from rows of corn to sea turtle eggs, to baby deer and goats. They're wild pigs, aka feral swine, wild hogs or Sus scrofa. And biologists at the National Wildlife Research Center in Fort Collins have invented a promising new way to track the invasive animals by looking for tiny traces of them in mud and water. Biologist Morgan Wehtje points to a boar who's asking her to scratch his bristled back. At 280 pounds, he weighs about as much as an NFL tight end. "His name is Makunakane, which means 'Big Papa' in Hawaiian," says Wehtje. The smaller pigs, like a female named Bobbie Socks, weigh about 150 pounds. They're dense and compact, says Wehtje, "which is why if they were to run at you they'd take you out." They are opportunistic omnivores. If they can get their mouth around it and it has a calorie in it, they will eat it. Wehtje and her colleagues study the biology and behavior of these pigs, which were raised in captivity. They're playing in the snow and scoping out the fence with their wet snouts. But their wild, much less cuddly counterparts are destroying the landscape in most U.S. states — inflicting an estimated $1.5 billion in damage per year. These animals will eat anything, from rows of corn to sea turtle eggs, to baby deer and goats. "People don't realize that wild pigs are voracious predators," says Jack Mayer, a biologist with the Savannah River National Laboratory in Aiken, S.C., who has studied wild pigs for 40 years. "They will run down and kill and eat lamb, sheep, goats, calves, domestic chickens." "Pigs will eat humans," says Mayer. "It's been documented in combat, remote area homicide situations and plane crashes. Pigs will go in and feed on human carcasses." They are "opportunistic omnivores," Mayer says. "If they can get their mouth around it and it has a calorie in it, they will eat it." In Texas, feral pigs are tearing up suburban yards. In Louisiana, they damaged levees by digging for food. Pigs came to North America 500 years ago with early explorers as a source of food. Centuries later, the Eurasian wild boar was introduced to parts of the U.S. by sports hunters, and today's feral swine are "a combination of escaped domestic pigs, Eurasian wild boars, and hybrids of the two," according to the U.S. Department of Agriculture. Kelly Williams of the National Wildlife Research Center in Fort Collins checks a sample of dirty water from Texas that she's about to analyze for bits of pig DNA. Once female wild pigs are about 6 months old or so, they can produce as many as a dozen offspring per year. For a number of reasons that haven't been completely nailed down, their populations have really exploded in the last 30 years, Mayer says. There are now at least 6 million wild pigs across the country, with established populations in 35 states. State and federal legislators have funneled a lot of money into controlling and eliminating these animals because of the trail of destruction they leave behind. But controlling them can feel like an infuriating game of whack-a-mole, because they move a lot, reproduce quickly and are smart enough to learn to avoid traps and bait. They're also sneaky. "These things are very secretive," says Mayer. "A lot of people didn't know about wild pigs until they walked out their front door on Sunday morning and saw that it looked like somebody on drugs had rototilled their yard." But the pigs may have met their match. Kelly Williams, a biological science technician at the National Wildlife Research Center, is going high-tech on these hogs. She and her colleagues at the National Wildlife Research Center have recently developed a way to keep tabs on the animals without ever even laying eyes on them. All she needs is a scoop of water. "So, for example, right now in New Mexico the forest service is out collecting water for me," says Williams. "All they have to do is carry around a little Nalgene bottle, scoop up a water sample and ship it back to me." "We know pigs are pretty messy, dirty animals, so they might shed more DNA than a coyote lapping up water or something," Williams says. She worked with wild pigs at the National Wildlife Research Center to identify these tiny bits of DNA — called "environmental DNA," or eDNA — which can sometimes be detectable up to a month after a pig has visited a site. Ecologists have used eDNA to monitor invasive fish in the Great Lakes and endangered whale sharks in the Arabian Gulf. Williams' colleagues developed a version to track the presence of Burmese pythons in Florida. Wild pigs are one of the first land animals to be tracked so extensively using eDNA. Williams starts with a bottle of dirty water, mixed with a solution to preserve the DNA inside. "Sometimes it looks like chocolate milk," she says. "Sometimes it looks like lemonade." Williams spins down all the solids in the liquid sample, amplifies the DNA inside, and compares what she finds to 125 base pairs of mitochondrial DNA that could only belong to a pig. At the end, she gets an answer: "Yes, pigs were here," or "No, they weren't." She then passes the results along to people like Brian Archuleta, a wildlife biologist with the U.S. Department of Agriculture's Animal and Plant Health Inspection Service in New Mexico. Archuleta has a goal for the new year: wild pig annihilation. "Total elimination by the last day of September of this year," he says of his goal. Archuleta is not joking. 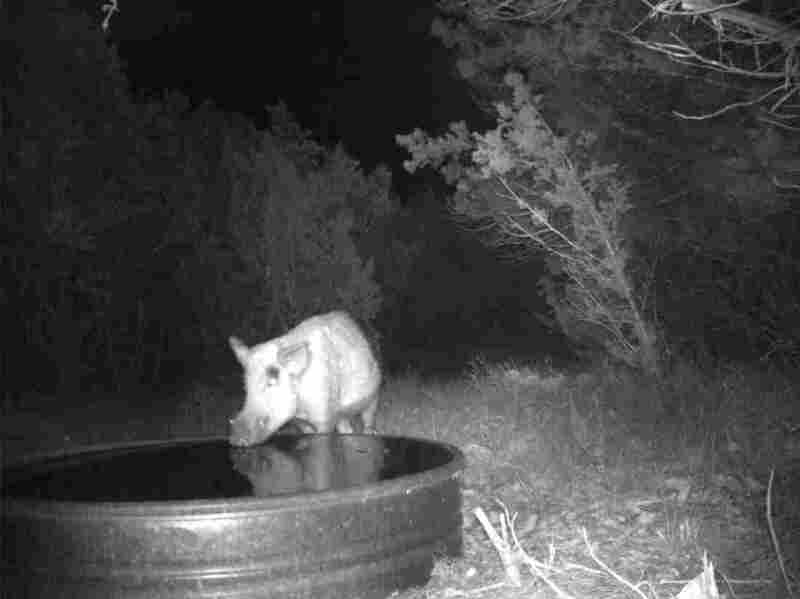 Researchers set up cameras in the wild in Texas to confirm that their test for pig DNA corresponded to visits by actual wild pigs. He covers eastern New Mexico, which is not only thousands of square miles of desert, mountains and sand dunes, but also right next to Texas, which is teeming with pigs (not to be confused with javelina, a smaller, unrelated species native to the Americas). To track wild pigs in his region, Archuleta used to have to repeatedly send people out across deserts and mountains to place cameras, use dogs to sniff them out, and bait traps with tubes of corn. "The eastern side of New Mexico is a big place — lots of country. We are looking for a needle in a haystack," says Archuleta. 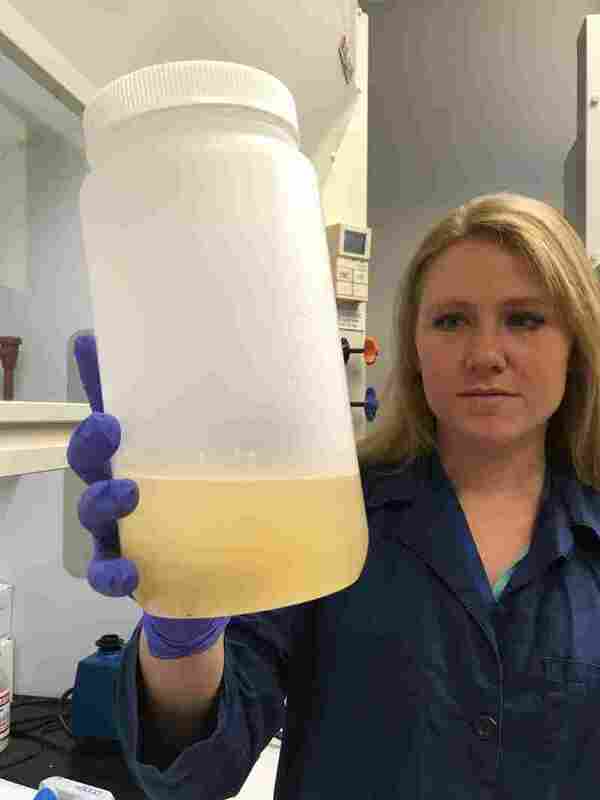 But recently, he just had a few people go out and collect water, and then shipped the samples to Kelly Williams. With the results he got back he was able to narrow the search to about 10 square miles in the desert, and another small area in the mountains. Next, Archuleta booked a helicopter, hired some sharpshooters and flew over the areas where pig DNA had been found. They shot eight hogs in one place and 13 in another. 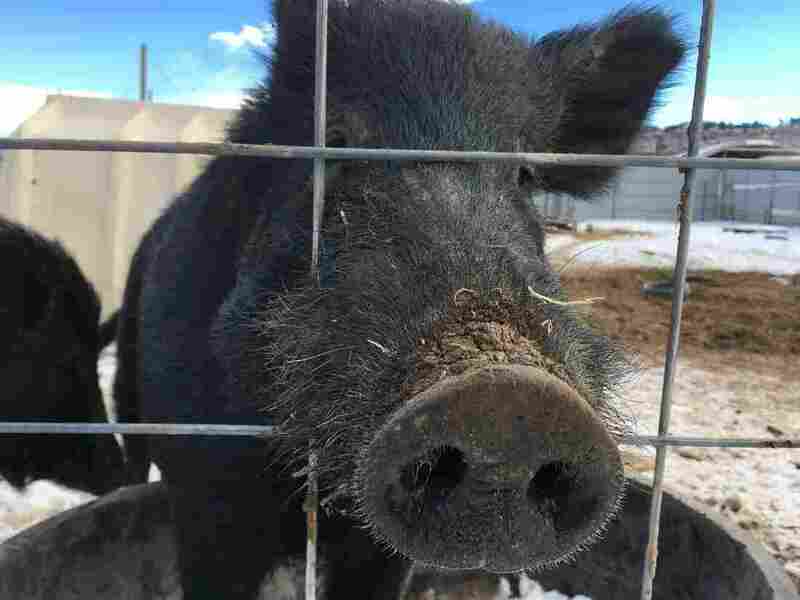 "There are unknown places in New Mexico that I'm sure have pigs that we just don't know about," he says. He's hoping the new eDNA sampler will help him find every last one. Meanwhile, Kelly Williams is already on to her next challenge. She's working on a way to use eDNA to track another elusive species — the Nile monitor. These hissing, tail-whipping, 5-foot-long lizards are expanding their reach in Florida. They eat endangered owls for breakfast.